Norway had pledged its support to provide modern technology to develop the Sri Lankan fisheries industry, Prime Minister Ranil Wickremesinghe said in the weekend. 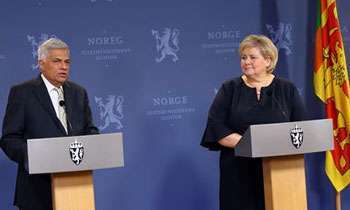 Minister Wickremesinghe said this at a joint media briefing with his Norwegian counterpart Ema Solberg in Oslo early hours of Sri Lankan time yesterday. The Premier thanked Norway for the assistance it had given to Sri Lanka in the past. “Sri Lanka received Norway’s assistance to develop rural areas such as Hambantota,” he said. Sri Lanka has sought Norwegian assistance to preserve peace in the Indian Ocean and to develop fisheries industry in Sri Lanka. Both leaders have also discussed sustainable development and thereby convert the Indian Ocean region as a sustainable development zone. And to continue with the agreements which two countries have already come to safeguard human rights and democracy. Ms. Solberg also assured maximum support to Sri Lanka. It was revealed that both Mr. Wickremesinghe and Ms. Solberg have agreed to shape the diplomatic ties of the two nations in accordance with the Geo-political situation in the world. This agreement was reached during the talks which the two leaders had earlier. Minister of Fisheries Wijith Wijayamuni Zoysa, MPs Dr. Kavinda Jayawardene, Hesha Withanage and Sri Lankan Ambassador in Norway Arusha Cooray, Secretary to Prime Minister Saman Ekanayake and Additional Secretary Saman Athaudaheti and Prime Minister’s Special aide Sandra Perera participated in these discussions.